Not sure why, but I have been craving yellow polishes. Not the bright neon yellow, but the pastel, baby chick yellow. This sweet polish named Ivory from CQ was just right for the mood. It is sweet and completely wearable on its own, but I stamped it with Sally Hansen Insta-Dri in Coco a-go-go and Mash plate Mash-44. I edged the nails using Coco a-go-go to give it a more finished look. I'm so in love with this mani!!!! Very pretty! I'm also glad to see that CQ is 3-free...I was trying to research that a while back and couldn't find info about that anywhere! So glad that you posted about CQ Ivory. The pearl finish kept me from buying it but now I am going to have to get it. Thanks! looks gorgeous! Love the pastel colour! I'm in love with Ivory and pearl finishes. Thanks for sharing this one, I'll have to keep an eye out for it! Wow anutka this is gorgeous! I am loving this big time! Oooh, I kinda like this color! Might have to go pick it up! 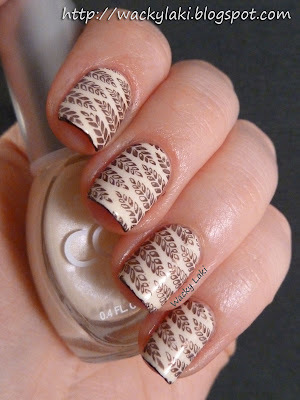 Your stamping is flawless as usual! So beautiful - the colors and the pattern reminds me of those lovely embroidered blouses sewn from really thin cotton with a white-tassled drawstring neck. Love what you did with this Mash Stamp. Thank you so much everyone for the wonderful comments! Your words are always so encouraging.